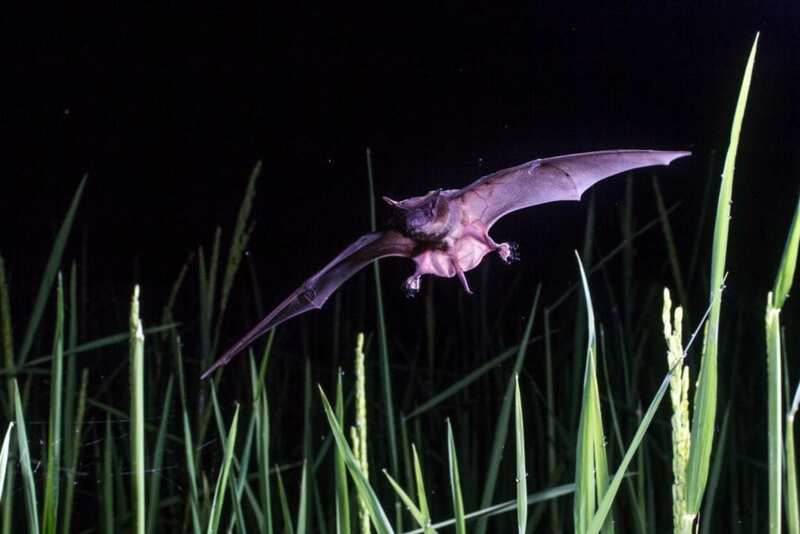 A new study shows that several species of bats are giving Madagascar’s rice farmers a vital pest control service by feasting on plagues of insects. And this, a zoologist at the University of Cambridge believes, can ease the financial pressure on farmers to turn forest into fields. There are few places in the world where relations between agriculture and conservation are more strained. Madagascar’s forests are being converted to agricultural land at a rate of one per cent every year and much of this destruction is fuelled by the cultivation of the country’s main staple crop: rice. A key reason for this is that insect pests are destroying vast quantities of rice, leading local subsistence farmers to destroy even more forest to create new paddies. The result is devastating habitat and biodiversity loss on the island. But not all species are suffering. In fact, some of the island’s insectivorous bats are thriving, and this has important implications for farmers and conservationists alike. Co-leading an international team of scientists, Ricardo Rocha from the University of Cambridge’s Zoology department Conservation Science Group, found that several species of indigenous bats are taking advantage of habitat modification to hunt insects swarming above the country’s rice fields. They include the Malagasy mouse-eared bat, Major’s long-fingered bat, the Malagasy white-bellied free-tailed bat, and Peters’ wrinkle-lipped bat. The study, published in the journal Agriculture, Ecosystems and Environment, used state-of-the-art ultrasonic recorders and molecular analysis to investigate the feeding activity of insectivorous bats in the farmland bordering the Ranomafana National Park in the southeast of the country. The researchers recorded over a thousand bat ‘feeding buzzes’ (echolocation sequences used by bats to target their prey) at 54 sites, to identify their favourite feeding spots. This revealed that bat activity over rice fields was much higher than it was in continuous forest – seven times higher over irrigated rice fields, and sixteen times higher over hillside fields – which clearly shows that the animals are preferentially foraging in these man-made ecosystems. The researchers suggest that the bats favour hillside fields most because lack of water and nutrient run-off make these crops more susceptible to insect pest infestations. The team next used DNA barcoding techniques to analyse droppings collected from bats captured within the rice plantations and nearby forest. All six species of bats were found to have fed on economically important insect pests. While the findings indicated that rice farming benefits most from the bats, the scientists also found pests of other crops, including the black twig borer (a pest of coffee), the sugarcane cicada, the macadamia nut-borer, and the sober tabby (a pest of citrus fruits). The researchers argue that maximising bat populations has the potential to boost crop yields and promote sustainable livelihoods. They are now calling for further research to quantify this contribution because Madagascar’s bats currently fall under game species legislation and are not actively protected in the country. Bats comprise roughly one-fifth of all Malagasy mammal species and thirty-six recorded bat species are endemic to the island, making Madagascar one of the most important regions for conservation of this animal group anywhere in the world. Local people may have a further reason to be grateful to the animals. While bats are often associated with spreading disease, Rocha and his team found evidence that Malagasy bats feed not just on crop pests but also on mosquitos – vectors of malaria, Rift Valley fever virus and elephantiasis – as well as blackflies, which spread river blindness.